Published By – Musical Moments (Europe) Ltd. Published By – Minotaur Music Ltd.
Download code printed on the inner sleeve. 12" x12" folded insert with list of pledgers from PledgeMusic website. Paintings and design at Blue Ink Creative. 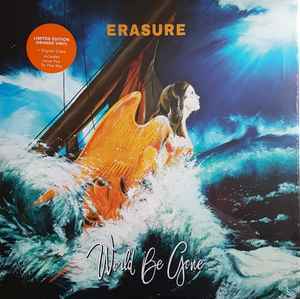 ℗ & © 2017 Mute Artists Ltd.
As a lifelong far of Erasure, it's hard for me to parse just what is so unsatisfying on this particular release (aside from the incredibly muddy sound of the vinyl, which is confusing). Andy's voice, as always, is in fine form, but the songs just aren't there. Highlights like album-closer "Just a Little Love" and dreamy club opener "Love You To The Sky" confirm they still have great pop stories to tell, but so much of the album goes by without moving the needle, it's hard to care very much. Where other low-key Erasure albums like Erasure s/t, Union Street, and Nightbird dripped with beautiful melancholy, this one just feels steeped in boredom to me. Sound quality is completely awful, easily among the worst I've ever heard. R.I.P World Be Gone, killed during mastering.